I originally planned on sitting this weekend out. C had to work all weekend (something I never enjoy, but that's the reality of being a lawyer) so I planned on staying home cleaning and doing laundry. But as it turns out whenever I plan to stay home to "clean and do laundry" I always find something better to do. This weekend was no exception. Friday evening was actually planned for several weeks. C, Mark and I went on the lovely Chocolate Walk hosted by the many lovely businesses in downtown Lancaster and organized by Main Street Lancaster. Living smack dab downtown, we have a vested interest in the well being of "Main Street Lancaster". Anywho, for $10 a piece you got a goody bag to take to the 30+ businesses participating and recieved something chocolate. I'm not talking about a Tootsie Roll here, I'm talking about chocolate dipped strawberries, chocolate wine (not too bad), loaded brownies, and chocolate fountains (to use, not to keep). We were also able to order a little something for our (hopefully) soon to arrive nephew. I ate more than my share of chocolate Friday night but fortunately the weight gained was lost on Saturday (see below). After the Chocolate Walk we ate at Fiesta Mexicana (now a tradition). I actually enjoyed my dinner which means I'm not due for another trip to a Mexican restaurant for several months (or the Chocolate Walk next year). Saturday morning C and I went to breakfast at Waffle House before he set off to Bexley and I set off to the store. I was a little disappointed we didn't run into Evan Turner and Jon Diebler there, but since they had just gone a few hours earlier, I wasn't really expecting to run into them either. Except I didn't get to the store. My mom called to see if I'd let the dogs out while she was at Mark's baseball game. I took that as an invitation to go with her (I think someone else let the dogs out). But before going, we went over to St. B's (I'm talking like an authentic Catholic now) to donate blood for my Other Mother's blood drive. I'd donated once when I was in Chicago so I didn't have any worries. My mom on the other hand had a bad experience 14 years ago and has been sending my dad in her place ever since. Well, dad wasn't available Saturday so she had to go in place of him going in place of her. While some donate blood to save lives, I had heard that there was free food and cupcakes which is what really got me there (there was one other perk, but I'll get to that in a sec). I made it through the questions, iron test, blood pressure, temperature and pulse check with flying colors. I'm pretty sure my stats could have been used as an example for other prime donor candidates. I was then taken to the elevated pool bench to start donating. Meanwhile my mom was still in the questioning booth (odd, because she went in before I did). Once I got all set up and my blood started flowing out of my body and into the pint sized bag (to me it looks bigger than a pint, I'd like to see if a pint of beer really fills that whole bag up) I saw my mom stand up with a huge smile on her face and walk in the opposite direction of the donation station. Turns out she failed the iron test. Saved by the ice tea. I really think she paid them off. Meanwhile I was busying saving lives so I could get my sloppy joe and cupcake. 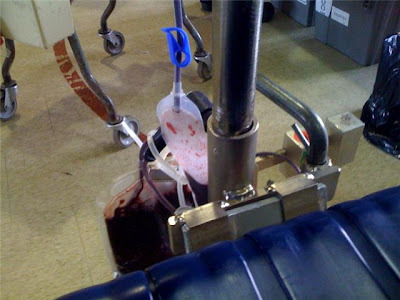 For a minute there I ran out of blood causing the flow to stop. But don't worry, they made sure to get an entire pint out of me. A couple of times the Red Cross staff asked if I was feeling ok while looking at me very concerned. I honestly felt fine, but by asking the question I thought maybe I didn't feel ok. I'm thinking it was just my general appearance. Oh, I forgot the mention the other perk of donating (aside from the great food and saving 3 lives). 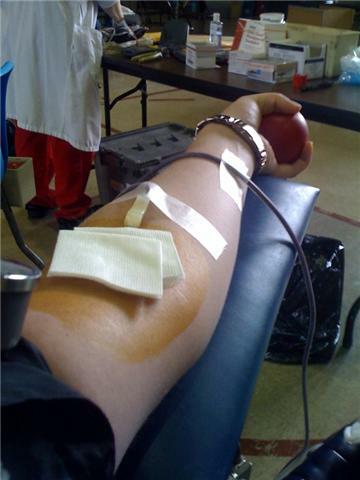 It turns out you lose 1 pound when you donate a pint. I'm going to be donating every 56 days from now on. Ok, realistically my goal is 4 times a year. I think that would make my Other Mother proud. Anyway, we made it out of St. B's, me having saved 3 lives and my mom having had to have her finger pricked twice (I'm told she's feeling fine today) and headed up to Mark's game. He had a great first game going 3 for 4 and sat out the 2nd game until coming in to close in the 7th inning. 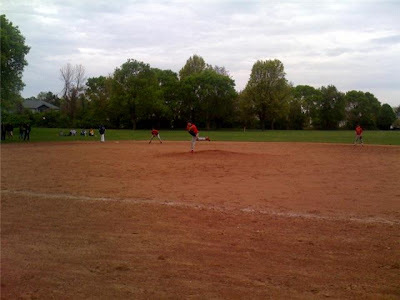 He struck out the first two batters and got the last out with a grounder that came back to him at the mound. All in all he did very well. I even managed to get an action shot. Then we headed to Johnny Buccelli's for dinner. 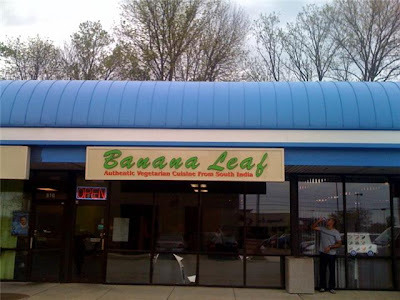 It appeared that the strip mall behind Johnny B's was a hodgepodge of ethnic food. 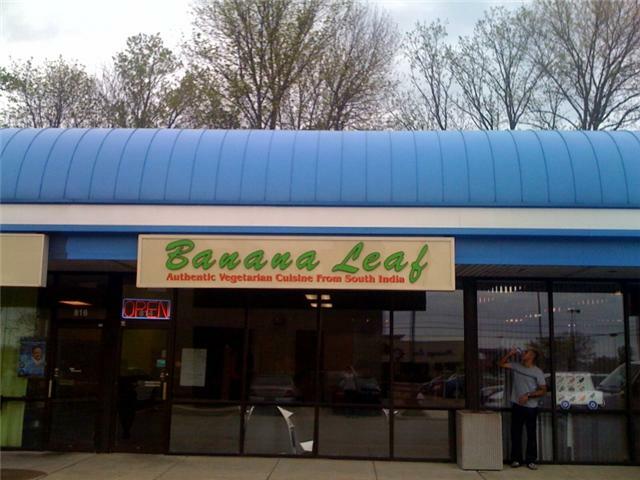 From a Mexican grocery to a Korean restaurant to an Indian grocery and catering business. That last one brought back some not so great Indian food memories. I did go in to see if they had tapioca chips. The poor guys had no idea what I was talking about. Apparently northern India and southern India have totally different snack foods. I passed on the "Faka Taka" alternative they offered me and joined the fam and Johnny B's. We then headed home with a quick stop at Kohl's (shoes for mom) and Meijers (much need groceries for us). Today (Sunday) I got to work in the nursery at church. By the way, our church has some of the cutest kids ever. Dad, Mark, and I had every intention of going to the Clippers game. After church Mark and I hurried home to change before going back to pick up dad from a meeting. Unfortunately on the way up it started to rain like crazy. Instead we headed to Skyline Chili before returning home for naps. After our afternoon siestas we watched some great basketball, amazing NASCAR finish thanks to super cool strategy, and some less than stellar baseball. Lebron did not disappoint with the Cavs, Kevin Harvick did an awesome fishtail move after riding the other guy's bumper for 1.5 laps, and the Indians stunk up the West Coast. But seriously, make sure to watch Sports Center tonight for the highlights from the first two events. Lebron had some awesome shots, including a half court, nothing but net, buzzer beater to end the 3rd quarter. The best part? He made it look like it's something he does every game. I'm now back home finally working on cleaning and laundry. Really only laundry. I finally found my camera cord (I think, I haven't actually hooked it up to see if it is the right one) so I'll probably spend the rest of the evening uploading and "editing" pictures from the last month. I also have a recipe to post this week. I haven't tried it yet, but will take my Other Mother's word that it is divine.